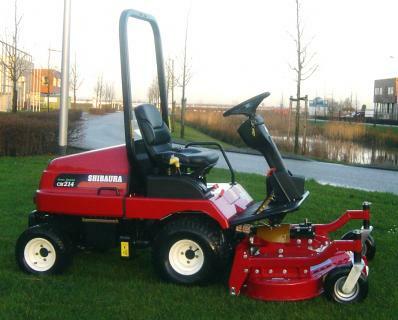 The most compact Shibaura front mower is the CM214. The CM214 is of excellent quality, is equipped with a 3-cylinder diesel engine and has a power of 21 hp. The CM214 is provided with standard hydraulic power steering. The CM214 is a beautifully compact machine with plenty of seating/leg space. The plane floor makes it easy for the driver to mount and dismount the machine. The 28 litre fuel tank allows you to work all day without refuelling. The machine is characterized by an excellent balance between power and weight, which results in maximum stability. The hydrostatic drive makes it possible to control speed and direction accurately. The easy to reach maintenance points allow easy maintenance. The rotary mowers can be placed vertically without disengaging the power take-off, which means that you can quickly clean or change/sharpen the blades. Standard, the CM214 is provided with an automatic and permanent four-wheel drive. As soon as the front wheels lose their grip, the rear-wheel drive will automatically be activated. When the tires have their normal grip again, the four-wheel drive will be switched off. As all of this takes place automatically, the driver can concentrate on his other work. On slopes or inclinations you can choose the permanent four-wheel drive. Deze geprinte pagina is op zaterdag 20 april 2019 om 12:37 opgevraagd. Houd er rekening mee dat de publicatie inmiddels kan zijn bijgewerkt. Aan de (on)juistheid van de informatie in deze (geprinte) versie kunnen geen rechten worden ontleend.